Stuart Chase in the Herald Tribune called this book about capitalism "the most realistic political treatise of the lot" and adds that "one must be tough and pitiless honesty and pitiless humanity." Some people may disagree with the fi rst assertion, but the second cannot be denied, for in this brilliant analysis of our social and economic structure Thurman Arnold pulls no punches. By "the folklore of capitalism" the author means those ideas about our social and political system that are not generally regarded as folklore but popularly and usually erroneously accepted as fundamental principles of law and economics. 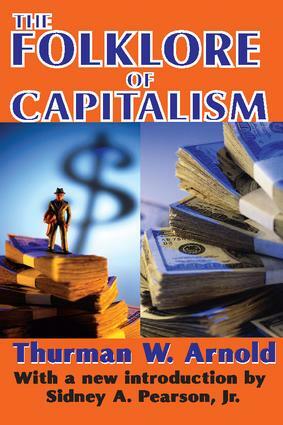 Th rough his searching scrutiny of this "folklore" about capitalism, Th urman Arnold presents a broad scale analysis of the ways in which America thinks and acts. Arnold is concerned with the manner in which our system actually works rather than with the moral principles that are claimed for it. With this purpose as a basis for his analysis, he exposes the virtues and absurdities, the basic facts and inconsistent gospels of American capitalism. He accomplishes all this with an irony and a sharp lucidity that are rare indeed in the treating of such serious topics.